Despite their perceived aura of invincibility, teenagers get sick, they hurt themselves, or they simply need someone to listen. 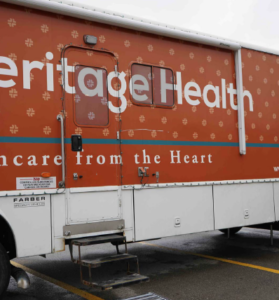 This is where Heritage Health’s 40-foot mobile clinic comes in to play. The School-Based Health Center serves hundreds of students across North Idaho every week. Typically, about half of the students are seen for a variety of medical issues and the other half are seen for mental health concerns such as depression, anxiety, or stress. Prindle, who is a certified Pediatric Primary Care Mental Health Specialist, said a new mental health counseling program consists of seven, 30-minute sessions. “These sessions can help kids change the negative thought patterns that can result in depression and anxiety,” said Prindle. The mobile clinic can provide a wide array of medical services, including vaccinations, checking for strep throat, ear infections, mono, sexually transmitted infections, and treating minor injuries. Heritage Health takes most forms of health insurance and it has sliding fee scale based on income. No student will be refused care due to inability to pay. Medications can be sent to the student’s preferred pharmacy. Parental Consent Forms can be found on the Lakeland School District website or on the mobile clinic. If a student does not have a signed parental consent and asks for medical care, all efforts will be made to contact their parents or legal guardian. According to Idaho State Law, patients over the age of fourteen may consent for their own healthcare.